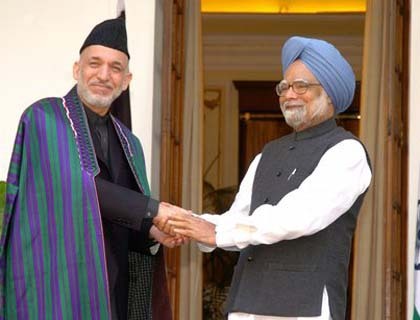 Amidst recent happenings in the region and in Afghanistan, Indian Prime Minister Manmohan Singh, in his second trip to Afghanistan, paid a two-day visit to Kabul last Thursday May 12, 2011. His visit followed Pakistani Prime Minister Sayed Yusuf Raza Gilanai's visit to Kabul on April 16, 2011. During his visit to Afghanistan, Mr. Sing held meeting with President Hamid Karzai and exchanged views on bilateral relations, war on terror, security situation in Afghanistan and in the region and made a historical speech at the Afghan parliament. His visit came amid regional and international efforts to increase cooperation on fight against terrorism. Because India's role in fight against terrorism and the country's assistance for the post-Taliban Afghanistan remains substantial, Afghan officials believe that his trip to Kabul will pave the way for further enhancement of mutual ties between the two countries, hopefully leading to a more stable and peaceful region if accompanied by other states' productive engagement. As the international system and the countries' roles in the world have changed much since the 17th and 18th centuries, they are seeking peace by creating peace in the neighboring countries and guarantee stability not only in their own territorial area but in a wider region. The long running battlefield Afghanistan has played significant importance to the regional and world stability; some political changes herein have impacted the whole world system. Afghan government sees Indian assistance as the very vital contribution to peace building and development here. As well, Obama administration has been putting emphasis on regional countries' role in creating peace and stability in Afghanistan. The US, holding the pioneer function in the Afghan mission, is keen to have India beside it for completing the job in Afghanistan and overcome the challenging situation in the region. The US sees India as great role player in regional and global issues and thus asks it for continuing efforts to prevent possible mistakes similar to those occurred previously. For that reason, the Obama administration has been seeking greater Indian involvement in Afghanistan. Following burning questions on India-Pakistan competitive role in Afghanistan, Indians have bluntly supported stability and development in Afghanistan which will extremely help stabilizing the region. Mr. Singh on Friday told the joint session of the parliament that Afghanistan had to make its decisions without "outside interference or coercion" and added that India was only interested in a stable, peaceful and independent Afghanistan at peace with its neighbors. He said the two nations must not allow the flames of extremism and terrorism to be fanned. "Terrorism and extremism are alien ideas to our people. They bring only death and destruction in their wake. They provide no answers to the problems of poverty, illiteracy, hunger and disease," he said. Replying to a question, Dr. Singh said that India wants friendly relations with all the countries in the region, including Afghanistan and Pakistan. Addressing the parliament, he said Afghanistan had embarked upon a process of national reconciliation. "We wish you well in this enterprise. It is up to you, as the people's representatives, to make decisions about your country's future without outside interference or coercion. This is your sovereign right. India will respect the choices you make and the decisions you take," Singh said. He added bin Laden's death can be an opportunity to put aside decades-old regional rivalries and work for peace across Afghanistan and Pakistan. "I sincerely hope that all countries of this region — Afghanistan, Pakistan, India — would recognize that this is a unique moment in the history of this region. Thereby we all should agree to work with unity to end this scourge of terrorism," Singh told journalists on Friday. India, a strongly rising economic and military power in south Asia, can play more important roles in developing this ruined country, building democracy and supporting the governing system. It has surely done a great job in the reconstruction process in Afghanistan. It has contributed some 1.5 billion U.S. dollars to the post- Taliban Afghanistan since 2002 to help rebuild the war-battered country. Other than political supports and serving as a model for the fragile democratization process in Afghanistan, the country's assistances mainly include big reconstruction projects such as the power transmission line from Uzbekistan to Kabul, asphalting Zaranj-Delaram road, construction of Afghan parliament building, providing thousands of scholarships for Afghan students in India and hundreds of small community projects across the country. With respect to India's continuous financial aids, Prime Minister Singh pledged additional 500 million U.S. dollars to the war-torn Afghanistan. "India has contributed around 1.5 billion U.S. dollars so far and would contribute another 500 million U.S. dollars within the next few years," Prime Minister Singh told reporters at a joint press conference with President Hamid Karzai at the presidential Palace. The Indian prime minister also described India as a good friend of Afghanistan, saying his government would continue to support the country in social, agriculture and cultural affairs on long- term basis. Moreover, India can serve as a great pattern for the nascent process of democratization in Afghanistan. The two countries bilateral ties include cultural and political exchanges. Afghanistan Foreign Policy Doctrine sets out "friendly political and economic cooperation with the big regional powers, including India…" as one of its ten principles. Moving towards implementing of the tenth article of the foreign policy doctrine, Afghanistan's diplomacy foregoers have listed strong relationship with India as one of their regional priorities. By various means Afghanistan and India are two friendly nations working towards realization of "stability and democracy dream" in this war-ravaged country. The world's biggest political democracy, with brightened reputation in the international arena, India is a perfect democratic model for Afghanistan to imitate. India's culture of diversity and tolerance reminds us about the fact that Afghanistan's ethnic, lingual and religious differences are less important than the national cohesion that must be developed and must exist. In India the decision making processes are structured in a just way within which complete inclusiveness and fairness with representation of all its minorities can be observed. With around 20 official languages, more than a hundred newspapers and 90-million-circulation a day, India is a true messenger of "one nation" dream for Afghans. The post-Taliban constitution of Afghanistan gives equal rights to "all Afghans" and recognizes primary and civil rights for all people living in this country, but such articles are still to get institutionalized with a more responsive action of our executives and decision makers. Anyhow, there are many things for Afghanistan to learn from India. India's provision of equal opportunities, rights and advantages for country's variety of races, religions and factions is a well-known sample for other countries, such as ours, that want to successfully practice democracy. In light of the recent political controversies in the country, elections commission of India can serve as appropriate channel to provide assistance and advices to the elections commission of Afghanistan. The mystery of long controversial elections in Afghanistan has changed to an enigma for the government officials and the people. India can serve as good pattern in this regard too. Afghanistan, the most recent democracy can learn much from the world's biggest democracy. To conclude, India's economic aids to Afghanistan, political integration, trade ties and peace building efforts remain highly substantial to peace building and reconstruction in the post-Taliban Afghanistan.